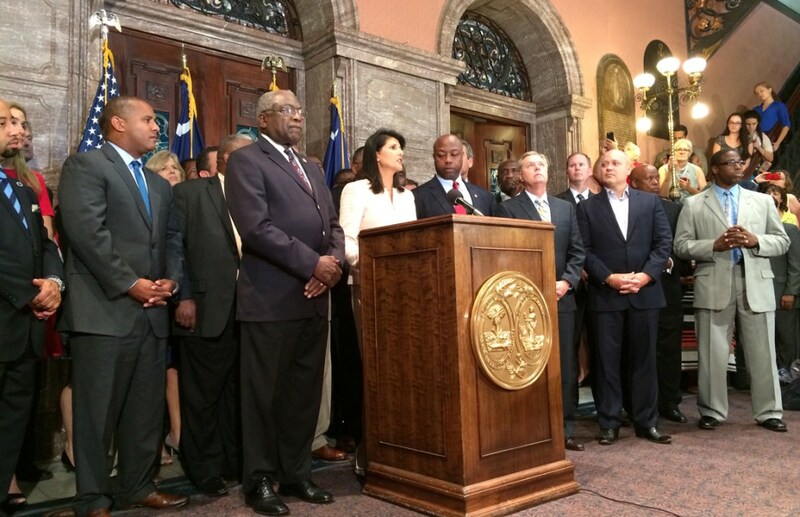 A moment in our history that makes ME proud: Leaders stand with Nikki Haley as she calls for the flag to come down. 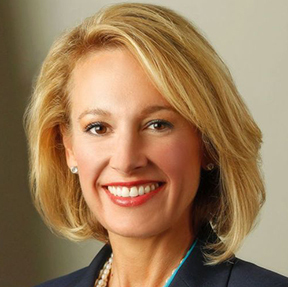 First, let’s give Catherine Templeton credit for doing one right thing. Or rather, for not doing one horrible thing. It would have been truly horrible to, like Sheri Few, play to the Trumpian faction in her party by denouncing the removal of the Confederate battle flag from the State House grounds. But she didn’t do that. So, kudos there, as far as it goes. But I am South Carolina born and raised, and I am proud of our history. We are standing on the shoulders of giants, and I don’t apologize for that…. I am proud to be from South Carolina. I am proud of the Confederacy…. I’d like for her to have elaborated a bit more. I’d like for her to have spelled out what it is about the Confederacy that makes her proud. I want to know because being proud of the Confederacy — an insurrection against the United States, based in the rebelling states’ wish to continue the institution of slavery (and they were quite specific about that, whatever neoConfederate revisionists may say) — and being proud of South Carolina are not the same thing. What is it about the Confederacy, as opposed to South Carolina, that gives her a warm feeling? Is it just that she has an affinity for, say, a slower, more traditional, politer, more agrarian way of life than the mercantilist, impatient, abrupt way that Yankees chose to live in their big cities? And once you say you’re proud not only of South Carolina but of the Confederacy — the low point in the South Carolina story — it causes me to wonder what else it is about “our history” that makes you proud. Are you proud of the role South Carolina played in the Revolution? Are you proud of John Laurens, the Founder from SC who was a courageous critic of slavery? Do you take pride in the wit of James L. Petigru, who of secession said “South Carolina is too small for a republic and too large for an insane asylum”? Does your pride turn to science? Does your chest swell at Charles H. Townes invention of the laser? If so, I share your pride. On the other hand, are you proud of Ben Tillman, Cole Blease and Cotton Ed Smith? I am not. Here’s a Rorschach test for you: Are you proud of Strom Thurmond? And if so, which version: The Dixiecrat who famously filibustered civil rights? Or Ol’ Strom who later devoted himself to constituent service regardless of the color of the constituent? Are you proud of his son Paul, who so eloquently explained why the flag had to come down? For my part, I’m deeply proud of my state and its leadership for taking down the flag, and for the reasons and way they did it. Is Catherine Templeton? Or does she merely not want to “second-guess” them for “what the people in the Statehouse did when I wasn’t there?” Because to me, she really seemed to be damning them with faint praise. Nullification: Are we going to do it again? This entry was posted in 2018 Governor, Confederate flag, History, Republicans, South Carolina, Southern Discomfort on August 3, 2017 by Brad Warthen. I confront this when doing genealogy. I can’t avoid it. I’m descended from slave owners irrefutably. We have family letters that mention the slaves they owned. Part of my family moved north in the early 1800’s because they rejected slavery. I’m from the part that stayed here. I have a great great great great great uncle from Newberry who signed the articles of secession. I’m not real proud of it. Three-fourths of my family tree is South Carolinian. Some owned slaves; some probably did not. The only documentary evidence I’ve found either way is from early 19th-century census documents, which break down the family by age, gender and race. The other day I ran across a census document about someone I would have THOUGHT owned slaves (because of his close family connections to folks who did), but didn’t. And I was curious to know the story: Was it a matter of principle, or was he just poor? History is history. None of us have any reason to be proud or ashamed of anything that we didn’t do ourselves. Some people get emotionally invested in their ancestors. I don’t get that. I love my parents, and my grandparents. I knew a couple of great-grandmothers, but was never close enough to them to have deep emotional attachment. And the people before them? I never met them. What’s to be proud or ashamed of? To me, genealogy is an intellectual pursuit, and one that I greatly enjoy. It’s not about emotions…. Although I admit that I’d rather be directly descended from Richard the Lionheart, rather than his rotten brother John Lackland. And it’s FUN to find people like Strongbow and Fulk FitzWarin, because I dig history, and I learn a lot looking these people up. Yea, I think I enjoy it because of the history. Even when it’s the nobodies – it still makes me want to know about the historical circumstances of the day and how my nobody might have fit into it. I wouldn’t know a thing about Ulster Scots and Covenanters and Scotch Irish Migration to SC had my nobody Scotch Irish ancestor not been in the middle of it, which made me look it up. And it’s easier or maybe more fun to imagine what the history might have been like when you have a real name of a real person, and sometimes a picture, to attach to it. My feelings of guilt or not proudness are complicated I think by knowing that many of the previous generations of my family were quite proud of the confederacy and did search genealogy for the famous people like it gave them more clout, which I agree it doesn’t, because we are not them and they are not us. Yep, it’s complicated, which is another thing that makes it fun. And learning more about history is one of the most fun and complicated things about it. Which is a reminder to me… Even when I’m discovering those famous, powerful ancestors and recording the links to their Wikipedia pages, I tend sometimes to do no more than that. I go, “and here’s a Wikipedia page!” and fail to stop and READ all of the page, and follow the links that would tell me more about what was happening in that time and place among those people. Too often, I just look at the Wikipedia page to find the names and links to that person’s parents, and then do the same with them, and then with their parents. I get on a roll with these kings and queens and counts and earls, and don’t slow down to learn more. And now it’s happening with the everyday, ordinary folks as well. Now that I’m actually a paying member of Ancestry and I get all those thousands of “hints,” I race through all that new data and add entire families with a few clicks, and don’t stop to study the documents and absorb the information. I need to find out more myself. I’m sure it’s more complicated than this, but Covenanters and Seceders, as I understand it, were both groups of Scottish Presbyterians who had some sort of beef with the church of Scotland and also with swearing allegiance to a monarch. I believe there was persecution involved in the 16 and 17 hundreds. Both groups broke away and ended up in America starting about the mid 1700’s, often by way of Northern Ireland, where they were called Ulster Scots. Once over here, they banded together and made the Associated Reformed Presbyterian church and founded Erskine College. I’m not sure if my people were Covenanter or Seceder or what exactly the difference between them is, but I know they left Larne, Northern Ireland in 1772 with 5 ships that were all from the same congregation and ended up being ARP in the Prosperity/Newberry area. I don’t have my line traced back beyond the ancestor that came in the boat from Larne. I wrote the Northern Ireland Government asking for help with sources (a long time ago, this was before the internet was really a thing). They wrote back and said, so sorry but your denomination really didn’t keep good records. Made me laugh. Now I know where I get my record keeping abilities. OK, that helps me narrow it down. A bunch of my peeps — the ordinary folk Richard thinks aren’t there — were ARP, and some of them played prominent roles at Erskine College. When I was a little kid, my grandparents were living in the home of the president of Erskine, on the outskirts of greater metropolitan Due West — an arrangement that probably happened due to those connections. Some of the folks in that part of the family came here from Ireland, but were only there for about five minutes. They were really Scots, which is why they were Protestants. And no, the records aren’t great. I’m pretty sure I’m descended from one of three brothers named Pressly who came over in the mid-1700s from Scotland by way of Ulster, but it’s confusing; the record is contradictory. When the day comes that reparations must be paid, this should serve as a notice that you and the Warthen clan should pay more than the Ross brood. My great grandparents on both sides hit the U.S. soil after 1900. I don’t think there were many slaves in Finland. Sorry to tell you, but Finland didn’t actually ban slavery until the 1950s. I’ll pay the Finnish reparations, you pay the American. Oh, and it’s not the Warthens. That’s the only fourth of my family that was NOT South Carolinian…. And Scout, I’ve looked to see if any of my ancestors signed the articles of secession and not found any — yet. But I did have kin who bore a good deal of responsibility. There was my great-great grandfather who raised his own company and led it into battle, although he came back from the front fairly soon and served in the Legislature for most of the rest of the war. But his eldest son continued to serve, and was killed in action in Virginia in 1864. I’m descended from a younger brother. My most prominent Confederate kin so far was James Chesnut, but he’s only a 3rd cousin four times removed (we’re both directly descended from an Alexander Samuel Chesnut who lived from 1672 to 1749). You know Mary Boykin Chesnut, the famous diarist who was quoted so much in Ken Burns’ “The Civil War?” Her husband. He was a big deal. He signed the Confederate constitution, and rose to the rank of general. He represented SC in the U.S. Senate, but quit after Lincoln’s election — even though he was a “moderate” on slavery. At one point during the war, he was a member of a triumvirate of guys who essentially ran South Carolina. It matters a great deal to me that Jesus said to a potential follower “Unless a man hates his father and mother … he cannot follow me.” He didn’t require hating one’s family, but he does often require abandoning one’s culture and upbringing – a complete break with traditions, taboos, mores, and folkways. Hard choices for a devout Jew in those days or a Southerner today. Repentance is required, in my view, to escape one’s personal, often hidden or repressed racism, not just a change of mind. Wooing voters can make that very complicated. Mulberry Plantation is an amazing place, and well preserved. It’s amazing there were any “nobodies” in history, because nobody who does their geneology are descendants… they’re always decsendants of famous or war heros, never dirt farmers or store stockboys. See, now there you’re wrong. Trouble is, the more humble folks are, the harder they are to trace. They leave less of a footprint. So too often, those of us who work on family trees can’t find them. For instance, my great-great grandfather Henry Waller was probably just a regular fellow. But I don’t know anything about him beyond his name, and I know NOTHING about his parents or anyone who went before. That’s in part because he’s this ordinary guy who went off to the War and didn’t come back. He died of disease at Petersburg. He never saw my great-grandmother, his daughter. She was born nine months after his last trip home. So she never learned, from him, anything about his family. So I don’t know, either. I’m aware of quite a lot of nobodies in my genealogy, actually, and I imagine anybody that does genealogy is aware of theirs too. Odd thing for you to say. Probably people don’t mention them as much because other’s have no frame of reference for them. Doesn’t mean they aren’t there, known about, and interesting. If you want to be bored I could tell you about my ancestor who was a boat builder from England, came to Massachusetts and became a coffin maker and eventually ended up in Kansas. I’ve got quite a lot of farmers actually, quite a lot of school teachers, a doctor here and there, a few engineers, and a postman that come to mind right off, none of them you would have heard of. Brad is right too. There are less records around for the plain old folks. But chances are the “nobodies” that are known are less likely to be brought up in casual conversation to people like you if there is no reason to suspect you have any shared interest or frame of reference. I think what Richard’s trying to do is intimate that we who have extensively traced our family trees are putting on airs when we mention prominent ancestors. What he misses is that I’m not PROUD that I’m directly descended from Henry II. For one thing, I know enough about Henry Curtmantle to see that as a dubious distinction. The bigger reason is what I mentioned before — that I deserve neither credit nor blame for what my ancestors did. One reason I have for looking askance at Henry is that he stripped my ancestor Strongbow of his lands and titles — which prompted Strongbow to start conquering over in Ireland to get him some new lands and titles. Which immediately dispossessed my wife’s people (the Phelans) in Waterford, and has caused no end of strife in the centuries since, since it was the start of 700 years of English (in this case, specifically Norman) involvement in Ireland. I guess, in that particular dust-up — King Stephen vs. Empress Matilda — I would side with the Empress. I say that because everything was personal back then, and the Empress was my great-grandmom while Stephen of Blois was only my 26th-great uncle — brother of my 25th-great grandfather Theobald II, Count of Champagne. Of course, one of the steps that links me to the Blois family is what was once called an “irregular connection.” I’m directly descended from Jasper Tudor, but through his natural daughter Lady Helen Tudor, who was NOT the daughter of his wife, Catherine Woodville. Helen was the daughter of his mistress, Myvanwy verch Dafydd. Catherine Woodville is, however, my 1st cousin 17 times removed. All those people are connected. Republican politicians have to walk a line in SC, and not to fine of one. Tick off the flag-waivers, and you don’t win in a primary. Same problem Democrats faced until about the 1970’s. One’s view of the history here isn’t perhaps as important as the courage to be honest about it – an honesty that can be a deal likely breaker in either party. She could have stopped at “I am proud to be from South Carolina;” what came after that was just pandering. Perhaps she will develop a more nuanced campaign style as she picks up experience. It’s an interesting strategy to run for Governor as one’s first try at public office. At least she’s headed a major state agency, though…. Who are the Democrats running? Well… then they need to stop complaining and blaming Republicans if they can’t come up with a solution of their own. Takin’ the lazy way out. The whole Lost Cause thing I find tricky. I actually have a certain sneaking sympathy with people who get upset at being constantly told that they have to be ashamed of their ancestry–especially by self-righteous nonsoutherners who had nothing to do with ending slavery but who seem to want to take vicarious credit for it. On the other hand, dammit, I’m a professional historian, and regard the Confederate project not simply as evil but as monumentally crazy and stupid. Even had the Confederacy won, slavery would not have survived; the war itself was breaking it up, as the Union armies provided havens for slaves to flee to and as increasing numbers of slaves voted with their feet. Interestingly, the wealthiest slaveholders tended to be hostile to secession; they knew that secession was a revolutionary act, and revolutions aren’t typically good for rich people. The secessionists were drama queens, posturing as heirs to the Founders (if you read the “Declaration of Immediate Causes,” it follows the Declaration of Independence quite closely–that “all men are created equal” bit excepted). But for the “long train of abuses and usurpations” part, they could find nothing that the oppressive federal government was actually *doing* to oppress them; they wound up attacking the northern states and people for having the strange notion that they, too, had rights of self-government, and were under no obligation to allow their neighbors to be kidnapped or to vote the way white southerners told them to (Really–it’s Lockean social contract theory gone bonkers). One of the really depressing things about being a southern historian is seeing how often my fellow white southerners have simply shot themselves in the foot for the sake of their obsession with maintaining mastery over others in the guise of preserving “their” liberties. TBS, the Calvinist in me sees vindication for the doctrine of innate depravity, but that can be cold comfort. Finally, I should mention that in my early years as a Vandy prof I used to teach a fun little freshman seminar on southern identity, and among the issues I constantly had to deal with was the obsession of a lot of my students with “southern pride.” I kept telling them that one can love the South, but “pride” is one of the seven deadly sins. It’s like loving your family when that involves going to reunions and hanging out with the ne’er-do-well cousin swigging from a hip flask. You don’t feel “proud”; you love them for the good things (the food, the music, the literature, the community and piety), but want them to be better than they are and abandon attachments to the bad. And the Confederacy needs to be abandoned. The Drive-By Truckers’s “Surrender Under Protest” nails the reason why. Oh, I agree completely. And I did my best, during my decades of fighting to get the flag down, to disassociate myself from such people. As I kept saying, the flag wasn’t their business. It was ours, here in SC. WE had to decide to bring it down, by consensus, or bringing it down would do no good. A lot of people had trouble understanding that. The NAACP certainly did, with their counterproductive boycott. I’m not ashamed of my ancestors. But I’m not PROUD of them, either. They just were what they were, and I am what I am. Neither of us can take any responsibility for the other. Which means reparations are out, Doug. And I can say that while at the same time being concerned about people living with multiple-generation effects of slavery and Jim Crow. Still, all of that said, I have a certain unconscious identification with the South. I used to think I didn’t, beyond a fondness for fried okra and such. (And even stewed okra!). I thought of myself as a sort of generic American, having grown up all over the place as a Navy brat, looking upon whatever community or region I lived in at a given moment dispassionately, without identification. I didn’t realize I was wrong (in a way) until once in the 90s, when I was having dinner at the home of my aunt and uncle up in Kensington, Md. I was heavily involved in trying to get the flag down by that time, and the subject came up. Confused, I opened my mouth to say, No, that’s the thing! We LOST the war, and that’s why so many can’t get over it… Then I realized that by “we,” he meant the Union. Well, you know, I support and believe in the Union and what it stood and stands for. I think secession was deeply wrong even without the motive of slavery. Some of y’all see me as an unthinking jingo in my constant support for the United States of America. But I assumed in that moment that “we” had to mean the South. Because, well, I’m a Southern American. And that’s why I felt as passionately as I did about the flag. It was our thing, and we had to take it down and put it behind us if we were to come together and move forward into a future that was better than our past. If it’s any consolation, West Virginia is even more masochistic; and they chose to run from secession. So there’s that. The thing that Southerners could better appreciate (as viewed by me as an outsider) is the way everyone is connected through a magical food culture. It’s the one nexus, the one cultural force that has never been devisive (regionally maybe, but never by race or class). Huh? Southerners are deeply passionate about their food culture folkway (Patterns of diet, nutrition, cooking, eating, feasting, and fasting). From BBQ, to local seafood, to vegetables, pies, and desserts, Southerners are very connected through food. Am I misunderstanding you here? I think you did. We appear to be in full agreement. I remember Pat Conroy’s anecdote from a speech in Columbia about how his cousin came up and said something like “You no good commie hippie SOB. Why can’t you stop sayin’ all that queer crap? See ya at the reunion next month. Love ya!” Of course, Conroy made no denial of having a dysfunctional family. For the Southern apologists, it is understandable and admirable to have feelings that run counter to slavery and to acknowledge the fact that it did exist and secession from the Union was the wrong thing to do. But, secession from the Union at the time was not illegal and was not counter to the Constitution. In fact, some Northeastern states threatened to secede from the Union in 1812. And just recently, a movement has been attempted in California to secede from the Union. Southerners have a bond that is very strong and it is not held together by lamenting the past and hoping for a return to plantation life with slaves picking cotton and all other things associated with slavery. Of course there are a few and a very few who wish the “old days” were back but there are idiots in every state wishing for a time gone by. I agree with Bryan about one of the bonds, food. Frankly, most of it is not very healthy but when it comes to “comfort food”, it is almost impossible to resist. Southern barbeque, hush puppies, bread pudding, fried okra, fresh butterbeans, deep fried pork chops, and a few other artery clogging delicacies are served at any decent restaurant describing itself as a place where “genuine Southern food” is served. My ancestors were some of the first settlers in the Charleston area but that was then, I live in the here an now. I am not pining for going back to the “gentile” days that are mostly fairy tales anyway. What I do wish for is for some reason and sensibility to be used when people outside the South try to paint us with the brush of ignorance and intolerance. It has been my good fortune to have traveled across most of this country and during my travels, ignorance and intolerance are just as prevalent outside the South as it is inside the South. In many instances, by comparison, Southerners are more tolerant than many I encountered in so-called bastions of tolerance. The flag is down, interred in a museum where it belongs. The South is changing and more and more from other regions of the country are moving in and bringing their cultures and ideologies. Some of the most liberal cities in the country are located in the South. Ever visit Asheville? Absolutely, Bart. So why didn’t Ms. Templeton say THAT? What possessed her to say, “I’m proud of the Confederacy?” Why those words? Is she just that thoughtless, or ignorant, or was it as nefarious as it sounds? Templeton’s comment was a bit of empty-headed pandering on the part of someone who likely doesn’t know much about the Confederacy beyond a couple of movies, a few battles and names and a symbol. It’s just too bad that in embracing the South and her southernness, she apparently doesn’t know how to separate the bad from the good. Which raises questions about her capacity to lead.